Changes in bird species distribution is an expected impact from global warming, and mobile bird populations can be critical first indicators of climate change impacts. 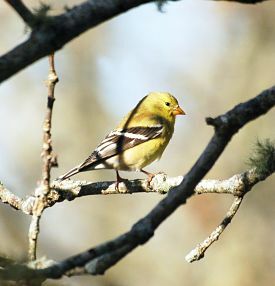 According to Massachusetts Audubon Society’s “State of the Birds 2011” report, range shifts of bird species were already occurring. Southern forest birds such as the Red-bellied Woodpecker and urban/suburban species like Tufted Titmouse and Carolina Wren had spread northward. White-throated Sparrows, at the southern edge of their breeding range in our state, were said to be declining, and many other species may follow suit as forest types evolve, especially migrants dependent upon multiple areas and habitats. Birdfeeders are a convenient way to study bird population trends and indirectly nearby habitat quality. Avian abundance and diversity at feeders sheds light on what birds we have and whether or not limited food supplies are increasing the use of feeders by a given species. In 2011 as part of the Biodiversity Initiative, we began monitoring feeders year-round at the Lloyd Center on a weekly basis. We are combining data from “Project Feederwatch”, a feeder observation program through Cornell University which includes participants throughout North America and focuses on late fall and winter bird populations (mid-November through March), and “Lloyd Center surveys” which are structured similarly, and cover spring, summer and early fall (April through October). Songbirds (passerines) which are predicted to be especially vulnerable to climate change are the focus, but any species that visits feeders are included in the survey. Surveys cover a two-day period and involve a tally of total numbers of birds that visit the feeder area during a count day. Because weather impacts counts, conditions (e.g. temperature, wind, cloud cover, precipitation, snow cover) are taken for each survey. Stay tuned for future data postings regarding this ongoing Biodiversity Initiative project.